If you’re on the lookout to skip the city madness and take a well-deserved break, head straight to Printemps Casa in Lonavala that promises to let you have that relaxing holiday you’ve been dreaming of. Lonavala is just under two hours away from the city. You can either take the beloved state transport Shivneri buses till there or drive down and enjoy the lush ghats that this monsoon has to offer. Do keep in mind that since it’s an Airbnb property, you will only get the exact location once your stay has been confirmed. Printemps Casa is like a stone palace that has a Greek vibe but is minimalist in nature. If luxury’s your key word, you’re in for a treat. Crafted from natural stones and teak wood, the 3-BHK pool villa has a garden with Australian grass for the lawn, and even exotic flowers to add that extra charm (in case it was missing!) 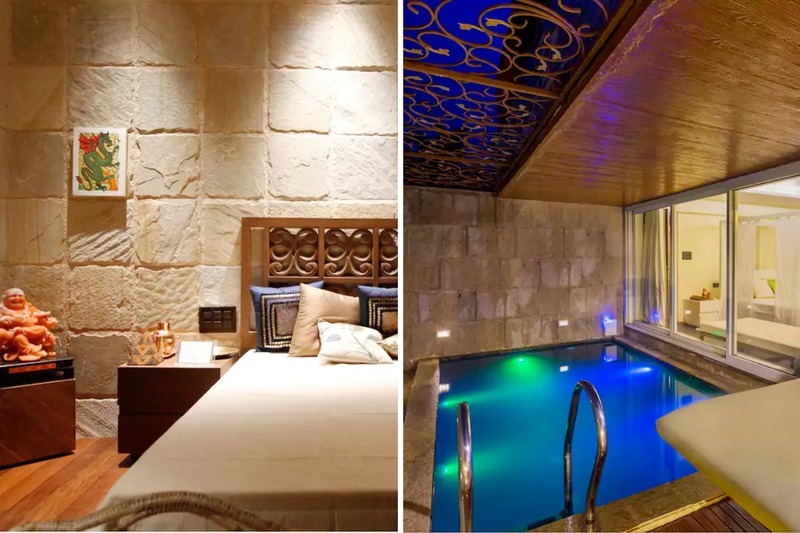 Moving into the villa, you can spend hours daydreaming or catching up with old friends in the lounge, and then unwind in the spa room that has a jacuzzi and a hot stone massage kit. There’s also a waterfall on the first floor and an infinity pool at the top, that adds to the charm (and luxury) of this place.What we’ve found fascinating is that they have a sky room that doubles as an open-air bedroom right at the top of the house, with king-sized beds letting you have a magical night, right under the stars.In case you’re in the mood for a solid workout, the place also has a gym, equipped with the latest facilities. Sounds dreamy, no? Okay, we just want to tell you that we’re stoked to have found this and have already shared it with our friends who can’t seem to get enough of it. Find your group of best buds and make your way to this special place that offers you everything you could possibly dream of. And more! The villa can accommodate a maximum of 15 people and will cost you INR 30,000 per night. While it’s a little on the steep side, it can offer you the world. What’s not to love?